Austrian polyolefins provider Borealis has extended its Fibremod technology portfolio with carbon fibre reinforced PP grades. Fibremod Carbon is targeted at the automotive industry to reap the benefits of carbon fibre-reinforced plastics, such as outstanding density to weight ratio, significant weight reduction potential, and increased functionalisation and modularisation of components. Furthermore, the company says the cost factor of the portfolio will also promote more widespread use of this material in the mass production of automobiles. With ever increasing demands for improved fuel economy, these materials are also finding their way into everyday passenger cars. European Union regulations to reduce CO2 emissions for new cars to 95 g/km on average by 2020 and the US Corporate Average Fuel Economy (CAFE) standard, which aims to increase the mileage of new car models from 17 to 26 km/litre by 2025, have created a new sense of urgency for lightweight construction. OEMs and Tiers continue to allocate a high proportion of their R&D budgets to develop new ideas for lightweight construction in high volume car production. Borealis took up this challenge. The use of carbon fibre leads to a significant increase in stiffness compared to traditional glass fibre construction. Fibremod Carbon compounds provide stiffness not seen before in PP, reaching up to 20,000 megapascal (MPa), combined with low density. Specific stiffness is a way of comparing the density and stiffness of different materials to determine the most effective solution. It is the established method to evaluate benefits to optimise lightweight construction. In this comparison, Fibremod Carbon is said to outperform even lightweight metals like aluminium or magnesium, leading to a lightweighting potential of more than 60% compared to steel. In practice, this means that components can be developed with similar or even higher stiffness and lower weight. For structural parts, the geometry can be adapted to best utilise the gain in stiffness, resulting in further weight-saving potential. Borealis says its Fibremod Carbon technology portfolio is also a cost-effective alternative to other engineering polymers, high performance polymers or even lightweight metals. The same weight reduction can be achieved with Fibremod Carbon as with materials such as magnesium or carbon fibre-reinforced polyamide, with the additional benefits of no contact corrosion, no moisture absorption and suitability for economic injection moulding processes, while at the same time incurring only half the costs, compared to traditional materials. 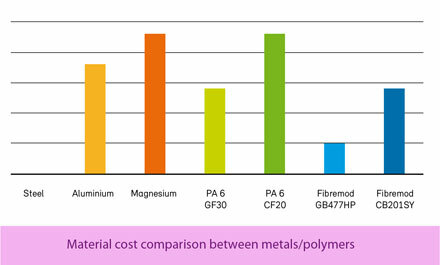 Compared to aluminium, the cost benefit is still significant; a comparison to PA6-GF30 shows neutral cost advantage, but a weight reduction potential of more than 30%. Because carbon fibre-reinforced PP grades are by nature complex, they require extensive engineering. For this reason, Borealis has developed computer-aided methods to predict fibre orientation and distribution, thus allowing for an integrative simulation of the final application performance. Borealis has also established testing methods and standards for fibre-reinforced PP and is fully committed to further enhancing its modelling and simulation methodologies. This means the company can provide support to its customers in developing and implementing new lightweight solutions based on Fibremod Carbon; expensive prototyping and physical testing of the final application can be reduced to a minimum, it says.